“Advocacy” may sound like a big word with a sizeable responsibility to match. The reality, however, is each one of us is an advocate whenever we take even a small step to talk about gun violence and gun safety with a relative, friend or neighbor. Whether we’re lamenting recent gun tragedies here and around the country or sharing statistics that move us, we‘re advocating and educating. When we write and call our elected officials voicing our concerns about ways to reduce gun violence, we’re also advocating and educating. And when we participate as a group in organized ways to show displeasure with the status quo and our support for change, we’re definitely advocating and educating. At this month’s meeting, three experienced advocates will share how they’ve made their voices heard. Al Frisby of JoCo MoveOn and Leslie Mark of Indivisible KC will share their groups’ advocacy successes and activities. In addition, Joy Koesten, a communications professional and former Kansas state representative, will discuss how to converse with people of opposing viewpoints. She’ll also share what kinds of advocacy were most effective during her tenure as a legislator. Join us Monday February 25! We’ll learn ways to make each of us and our organization a stronger and more successful advocate for gun safety and sensible gun legislation. 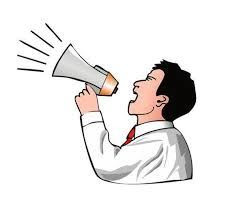 Watch this space in every newsletter for valuable information about our Advocacy Actions. At our January meeting attendees wrote postcards to their representatives in the U.S. House of Representatives (Sharice Davids of Kansas and Emanuel Cleaver of Missouri) urging support for H.R.8, the Bipartisan Background Checks Act of 2019, designed to close loopholes in the 1993 Brady Bill. H.R.8 would require background checks for all gun sales. Presently, only federally-licensed gun dealers “engaged in the business” of selling firearms are required to conduct background checks, which covers 60% of gun sales. The remaining 40% of gun sales are made to individuals whose backgrounds go unchecked. Those sales include transactions made over the internet, by collectors who occasionally sell at gun shows and by owners who advertise weapons for sale on classified ad websites. We believe the backgrounds of all buyers should be checked before sales are made. If you were unable to attend January’s meeting and want to send a postcard, letter or email to your elected official, please see our January Advocacy Guide for his/her address plus facts about H.R.8 and sample verbiage. If there were doubts about the value of advocating, we were reminded again of its importance by our January speaker. KU political science professor Don Haider-Markel described and contrasted the motivations and self-perceptions of gun owners and non-gun owners and how that affected their political activity during the past 40 years of presidential elections. His conclusion: gun owners are more active, more outspoken and vote more consistently than non-gun owners. Those are among the reasons sensible gun legislation has failed to pass in Congress. For example, surveys show 90% of the public supports universal background checks. But if those supporters fail to press their elected officials and also fail to vote for more like-minded candidates, gun-owners who oppose background checks will continue to exert more influence. You can read highlights of Prof. Haider-Markel’s presentation in the January Meeting Minutes or view his PowerPoint presentation. Legislators will discuss the current legislative session. The series continues through April. Check the Facebook page of the Johnson County League of Women Voters for details. Sponsored by the local chapter of Students Demand Action, the vigil will feature speakers including GAGV president Judy Sherry, Roslyn Temple of Mothers in Charge and representatives from MOMS Demand Action. Join us to show students our support and our gratitude for their efforts to continue the conversation about gun violence. Presentation by Dr. Shalya Sullivant, adolescent psychiatrist at Children’s Mercy Hospital, Kansas City. GAGV will staff a Lock It For Love table at the event. Event details. Presented by the Heartland Coalition Against Gun Violence, a program of Grandparents Against Gun Violence. Details to come about this signature community event. These articles about the NRA and gun sales in general illustrate why now is the perfect time to ramp up advocating. Even though Kansas and Missouri are land-locked, we really can help ‘turn the tide’ in reducing gun violence. Our GAGV friend Jan Pickler, who had served on our Board of Directors, passed away January 27 after a year-long battle with cancer. We greatly benefitted from her creativity and enthusiasm. 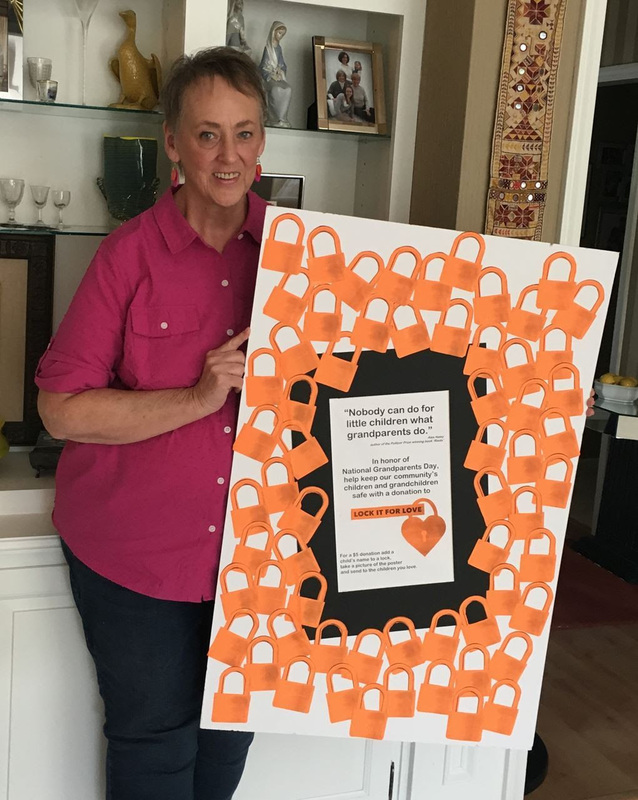 Among her other projects, Jan created table centerpieces for the 2017 Community Forum and the Lock It For Love fundraising project for last year’s observance of Grandparents Day. She leaves her husband George, their three children, six grandchildren and her many friends and admirers in GAGV. She will be missed. Read more about this remarkable woman. Please take a few moments to review our many accomplishments of last year along with our financial report. With the support of our 280 dues-paying members, our 1,771 database supporters and our dozens of committed volunteers, we anticipate building on our past successes to make this year even more exceptional. While our goals for 2019 are ambitious, we can achieve them – with your ongoing help! Distributed 1,061 free gun locks to people representing 185 different zip codes through GAGV’s Lock It For Love (LIFL) program. Some 39 GAGV volunteers staffed an information table at 49 different events. Organized the successful 5th annual Community Forum featuring Candace Lightner, founder of Mothers Against Drunk Driving (MADD). Close to 300 people attended the event that was co-sponsored by the Heartland Coalition Against Gun Violence and its 35 community organizations representing 10,000 metro residents on both sides of the state line. Provided thought-provoking monthly programs on a wide spectrum of topics dealing with gun violence, each drawing an average attendance of more than 70 people. 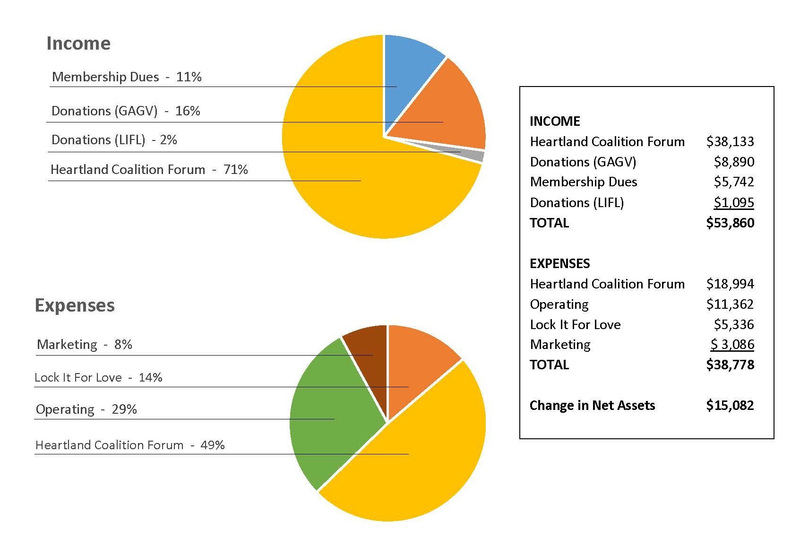 Added 54 new dues-paying members, bringing GAGV membership to 280. Included 685 additional contacts to our database, bringing its total to 1,771. Solidified LIFL relationships with Children’s Mercy Hospital and KCPD, partnered with nine more metro area police departments and collaborated with three Suicide Prevention Coalitions. Participated and asked to speak at marchforourliveskc and other events sponsored by Students Demand Action, bridging several generations of activists. Gave presentations and/or participated in panels at the invitation of 14 groups throughout the metro area plus the state convention of Women For Kansas held in Wichita. Continued to be recognized by local print and broadcast media as a reliable source in reporting gun-related issues in the news. Our 2019 goals are ambitious. With your help, they’re achievable! Continue to expand successful Lock It For Love program throughout the metropolitan area. Expand our public profile by participating in more community events and building new partnerships with other like-minded groups. GAGV Financials and Year in Review (pdf). 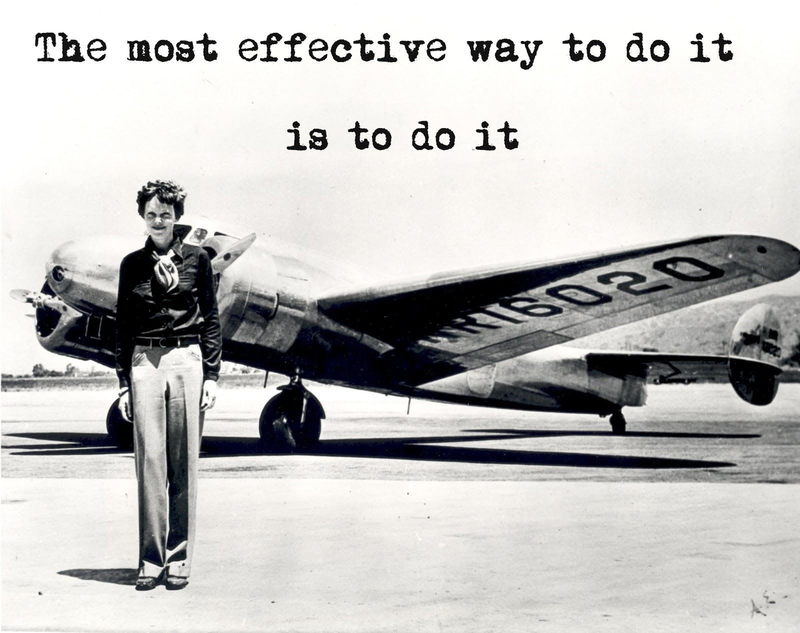 Amelia Earhart, the first female aviator to fly solo across the Atlantic Ocean.